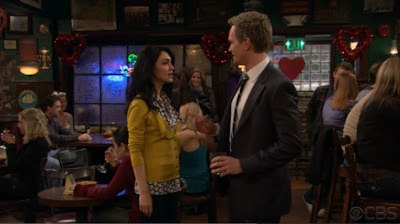 I absolutely adored this outfit worn by Robin's friend on How I Met Your Mother (episode: Desperation Day) last night. 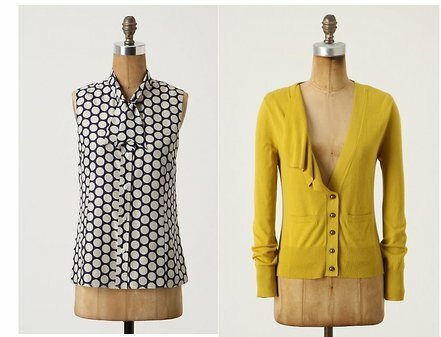 Both the shirt and sweater are from Anthropologie (click on either item pictured if you want the real thing). Screencap taken from the video at CBS.com. Because the two items are a little pricey, I went on the hunt for some inspired by pieces for less. Here's what I came up with - click on any image for more information (click HERE for the denim). Oh how funny. I just used that same exact photo for a post I wrote today called "A Single Dude's Valentine's Blues"! I always love what Lilly is wearing too. I really liked this look too and as I was watching last night, I KNEW it had to be an Anthropologie outfit. My suspicions are now confirmed. Thank you! Oh how I look forward to your posts everyday. Believe it or not, you make me spend more than any other blog. :) Ok let me put it in a different way, your amazing finds are so amazing that I had not seen before or even thought about and it makes me think, wow that is so cute. And then I have to have it. I really enjoy your blog. Thanks for doing such an amazing job. Love the inspired by posts based on How I Met Your Mother! I'm wondering if you saw the episode and could help me find a look 4 less of the wishbone necklace Zoey wore when she showed up at Ted's house. I put a screenshot of the scene here: http://img687.imageshack.us/i/screenshot20110216at349.png/. Thanks! !